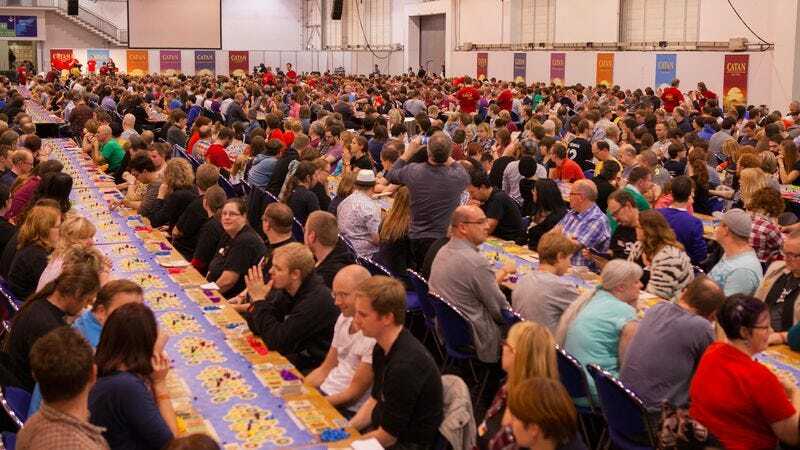 A record-setting 1,040 players taking part in a single game of Settlers Of Catan at SPIEL 2015. Photo: Merz-Verlag. I find Pandemic hard enough without permanently crippling the board. These games would be better served if they used Colorforms (or magnetic components) to adjust the game as it goes instead of asking players to tear up cards and pay out again once their board is ruined and only Atlanta is left standing. Having played a complete Risk: Legacy campaign and being roughly one-third of the way through Pandemic: Legacy, I strongly disagree that the games would be better served by reversible adjustments. The fact that cards get ripped up, stickers get permanently added, and writing is done in pen adds a real weight to your decisions. Do you treat the disease in Moscow because you risk losing this game if you don’t? Or do you treat the disease in Tokyo because another outbreak there will cause it to “fall,” resulting in consequences in every future game you play? The fact that you have no idea what the next twist will be from the event deck just makes those decisions all the more fraught. My group finished our April game last night and spent 30 minutes discussing which end-of-game upgrades we should use. I don’t think we would have been even half that thoughtful if we knew we could just wipe the board clean and start again if we didn’t like the results. I mentioned something once about the price of board games, and a friend reminded me that I’d easily pay that much for a video game. At that point, the entire system of false economies fell apart in my lap, and I now see entertainment value in what I call “disposable” or “one-way” games—games that become permanently altered and/or have a definite conclusion. I will say they’re not for me right now, but that is more related to my social outreach more than anything. I need something stable for the random company we might have. 504 reminds me of a time my old apartment attempted to graft Risk pieces onto Settlers Of Catan, resulting in a 5-hour nightmare of a game that no one should ever play. The process of writing the new rule set was lots of fun, though, and it sounds like 504 might be similar in that it’s more fun in the conceptual stages than the actual playing of the games. After the Catan/Risk debacle, I worry that I wouldn’t have the patience to experiment with it for too long if enough combinations ended up being sloppy, but it’d be a hoot to try once in a while with the right crowd. There’s just something about the way people perceive board games and their rules that makes them challenging. They’re more “physical” than a video game but at the same time they’re less tangible too. You read the rules and see the pieces, but it all seems very esoteric until you start playing, and so everyone seems to take to different rules and games. Arkham Horror is interesting because I feel like it’s frequently brought up for the reasons Michael stated. It’s the kind of game that is definitely more complex than something like Settlers Of Catan, but it’s also not that complicated, so it’s fairly popular with people getting into games but appears so daunting that it scares potential players away. 4) offer light advice if they appear distraught or indecisive, but don’t hold their hands or flat out tell them what to do. Xenogears: Totally worth finishing. One of the most interesting games to come out of that period in the late ’90s when game developers were experimenting with all sorts of crazy ideas. While the second disc is infamous for being mostly exposition, the game explores a wide variety of issues and themes that most games nowadays would still hesitate to touch. The soundtrack by Yasunori Mitsuda is a stone-cold classic. Xenosaga Episode II: Essentially the nail in the coffin for this series. Due to a number of very questionable changes made by the suits in charge (including but not limited to removing the main scenario writer, a shift in directors, a complete change in art direction, different voice actors for a portion of the main cast, a shorter playtime than the first, a very obtuse battle system, a lot of wheel-spinning in the plot), it sold and reviewed very poorly. It didn’t garner enough outside interest despite the changes that were made expressly for that purpose and alienated fans of Xenogears and the first game enough to swear off any further entries. It’s not all bad, though. The portion of the soundtrack composed by Yuki Kajiura is excellent, though it clashes with the background music by Shinji Hosoe, and there are some cool moments (mostly involving Albedo). Xenosaga Episode III: The best of the bunch. It attempted some serious course correction after the misfire that was Episode II by getting back most of the previous voice cast, putting Yuki Kajiura in charge of the entire, shifting to an art style more reminiscent of the first game’s, massive overhauls to the battle system, a healthy amount of callbacks to Xenogears, and honest-to-god closure for most of the main plot elements. It was too little too late, however, and while it faired well critically, the series was unable to recover and it died with this one. Xenoblade Chronicles: A friggin’ masterpiece of game design. The plot is really interesting and engaging, even if the writing isn’t always up to snuff. There’s a massive world to explore and a ton of things to do in it, another great cast of characters, an intuitive battle system that integrates the story element better than most, and it’s just plain fun. It strikes the best balance between action and story in the series to date, and it’s one of my favorite games in recent memory. Well, that should help get any interested parties up to speed. That’ll do it for this week, folks. As always, thanks for reading and commenting. We’ll see you all next week!